I offer readings both for free and for charge: your first 3-card reading is free as a gift, and further readings can be purchased on this website. A tarot reading can help by providing insight and new angles to look at any issue in life. the likely outcome in the situation. In all of my readings, the focus is on empowerment and finding a positive way forward. Tarot can make our inner world of thoughts, emotions, hopes and fears visible - making those easier to understand, discuss and resolve. Tarot is best suited for finding answers and solutions instead of predicting a fixed future - such a thing hardly ever exists. We all can make a positive change, once we have clarity about the direction. Tarot cards can offer timeless wisdom and clarity. 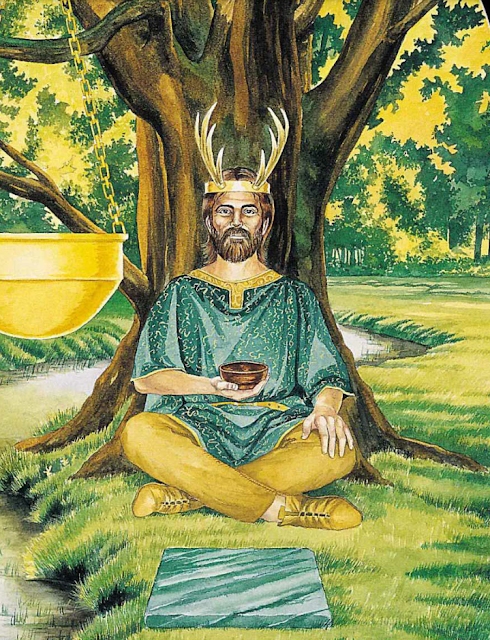 The Grail King (King of Cups), Arthurian Tarot. You blog provide a very important details about the Online tarot reading in Canada and i really appreciate it. I love how you focus on clarity and change, rather than prediction. You're right, prediction can change anyway! Cheat sheet - how to interpret Major Arcana cards? Cheat sheet - how to interpret Minor Arcana court cards? How to do timing with tarot - and why is it challenging? New Year 2019 - happy healing!